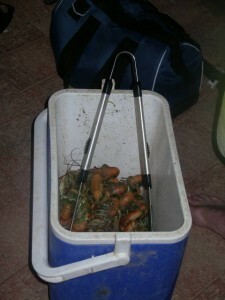 We went out on Saturday for a swim and a small feed of gilgies..(or yabbies). We have always called them gilgies. These were a bit dirty and not overly huge but tasted great none the less. I love the claw meat, its just a bit more juicy and with a good homemade sauce, even better. We sat and peeled them out from their shells whilst watching a lightning storm pass over our heads in the heat. The lightning was amazing to watch but we were also on fire alert.